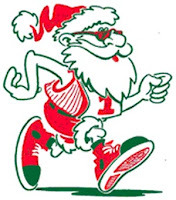 We have a few holiday runs scheduled over the next week or so, including a Boxing Day Run this Saturday from the Bowring Park west gate parking lot starting 10:30am. We will join our friends from New World Running Club for a 2k loop of the park and then break off and head down Southside Road to the lighthouse and back. New World have been great supporters of our club, providing volunteers for the Huffin Puffin, participating in our Inn of Olde Dash, and donating regularly to our "Kelda Fundraisers". Let's start a new Boxing Day tradition! !